Native Planet Season 2 – Coming Soon! Production of Native Planet’s six new one hour episodes and website is now over 50% complete! 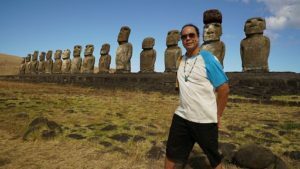 Since early 2016, the Native Planet team has shot episodes in Rapa Nui (Easter Island), the Atacama Desert in northern Chile, the Nyae Nyae Conservancy in Namibia, and most recently, around the shores of Lake Winnipeg. Next month, Native Planet travels to the Louisiana bayou and season 2 production rounds out this January in Nicaragua. Our profound thanks to all the indigenous communities who’ve graciously allowed us onto your territory and into your lives to share amazing Native Planet stories with the world! Follow host Simon Baker on his global journey at www.nativeplanet.tv or on our Facebook page – www.facebook.com/NativePlanet.tv.